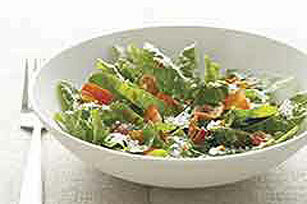 Try a savory new take on salad with the Parmesan-Bacon Spinach Salad recipe. In Parmesan-Bacon Spinach Salad, lovely spinach leaves and other salad favorites are tossed with Italian dressing and sprinkled with Parmesan. Easy. Elegant. Delicious! Cook bacon in small saucepan until crisp. Remove bacon from saucepan, reserving 1 Tbsp. drippings in pan. Drain bacon on paper towels. Stir dressing into reserved drippings. Toss spinach with bacon and tomatoes in large bowl. Add dressing mixture and cheese; mix lightly. Prepare using KRAFT Reduced Fat Parmesan Style Grated Topping.